As far as televised sporting mega events go, the World Cup has always been up there as my favourite. The euphoria of marching around my primary school playground chanting about how Scotland were on their way to win France ’98 is, at least in rose-tinted retrospect, a defining moment of being aged 8. Sadly that experience has never been repeated and an entire generation has grown up watching a Scotland team crown itself in glorious failure – coming close to qualifying for the 2004 and 2008 Euros, but never quite close enough. 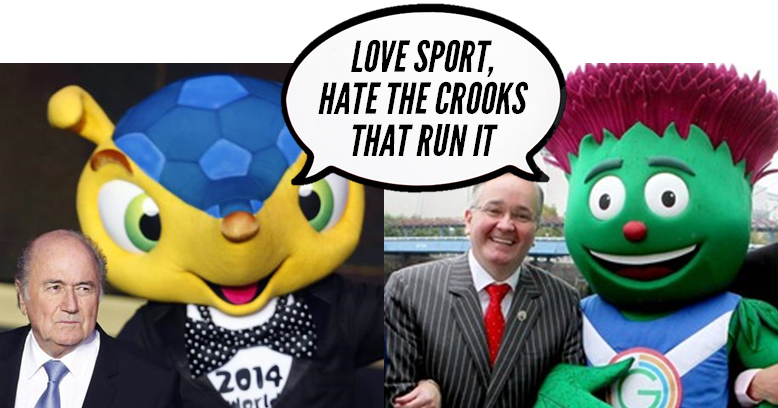 Of all the things I remember about World Cups in years gone by though, the mascots don’t feature very prominently. A scroll through the anthropomorphised emblems of tournaments gone is a run-down of creepy cartoon animals, puzzling stick figures and terrifying blobmonsters, all pretty forgettable when there was more important things to be getting on with like obsessively filling out wallcharts. Could that be all set to change with this year’s effort though, with the tournament being fronted by an ecology-conscious armadillo named Fuleco? Having garnered almost 1m likes on Facebook and a near 100% recognition factor in the host country, FIFA have already declared Fuleco to be “most successful FIFA World Cup mascot of all time”. While Fuleco may be blue and yellow on the outside, greenwashing seems to be his main game. Reppin’ an endangered species and with his name even deriving from a shortening of ‘Football Ecology’, FIFA are using Fuleco to play up the tournament’s green credentials, which are inevitably somewhat questionable. 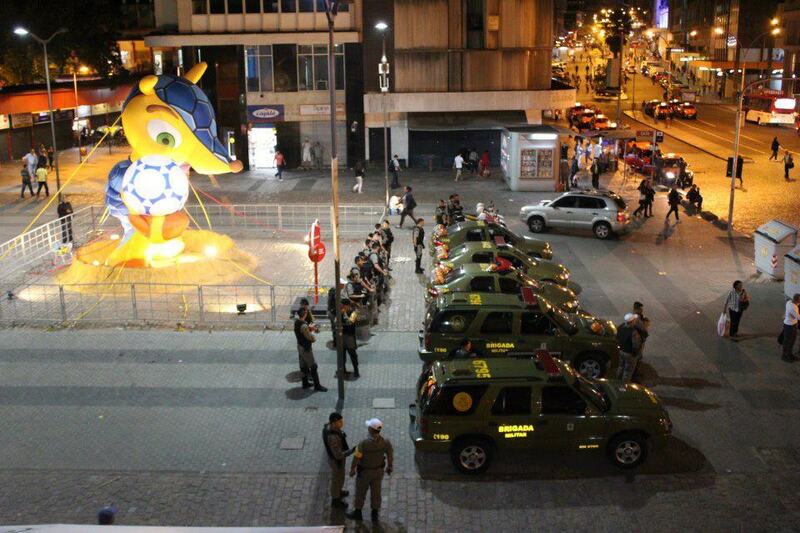 However, Fuleco has been adopted as a meme by those railing against the World Cup too. The tournament has started, of course, overshadowed by a year of huge protests against the impact of the event and its huge costs in a country with stark social and economic inequality. As readers may be aware, mega events always arrive in a blitz of social dislocation, corruption, land grabs, “exclusive economic zones” dominated by event sponsors, police crackdowns, and total subservience of nation states to the diktats of FIFA, the untouchable clique of gangsters and crooks who run world football. The poorer a locality that this takes places in, the greater the magnitude of this – without fail. 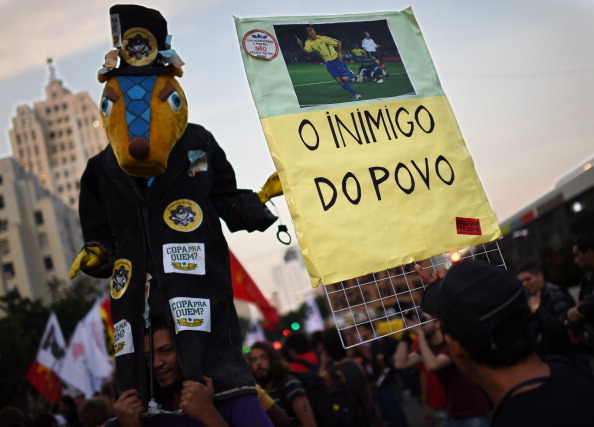 So it’s pleasing to see that Fuleco has been taking to the streets himself, first appearing in February, with protesters using him to symbolise everything that’s wrong with the World Cup. His pockets are stuffed full of money and a loose handcuff around one arm (cause he’s escaped the law), while it’s covered in stickers reading Copa Pra Quem, meaning ‘Cup for Who?’. Actually, this all sounds quite familiar. Could Fuleco be Clydezilla’s long lost Brazilian cousin? I really love your style of writing. All the best.